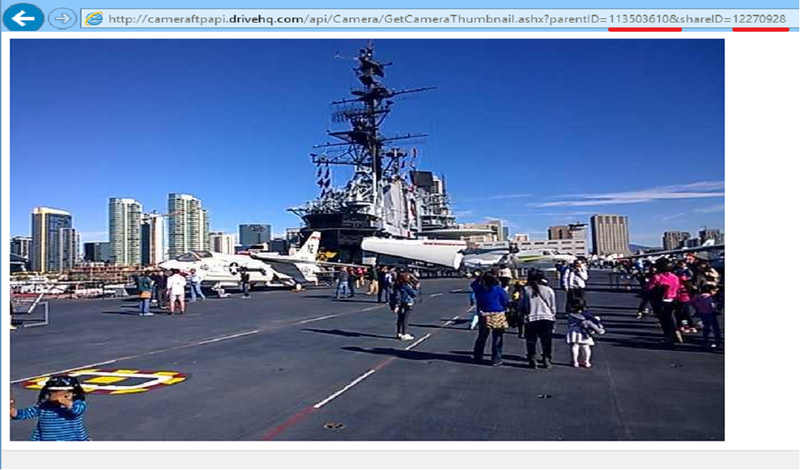 Publishing a camera for static URL access is very easy on CameraFTP.com. By default, all your cameras are private. No other users can see your cameras. To allow other users to see your cameras, you can use the Share or Publish feature. The Share feature is designed for sharing your cameras with a few specific people (using their email addresses or CameraFTP usernames). The Publish feature is designed to create static camera URLs for sharing with all users on the Internet. Whether to include your camera in the CameraFTP camera gallery. If you want more people to view your camera, then select it. In order to fit the camera in your web page, the embedded camera player has a simpler interface than the regular/non-embedded camera player. You can also tweek the size of the player and the mode. If you don't want your users to select an older time, then set "mode=live" in the URL; otherwise, remove "mode=live" from the URL and your users will be able to select an older time to play back the recorded footage. 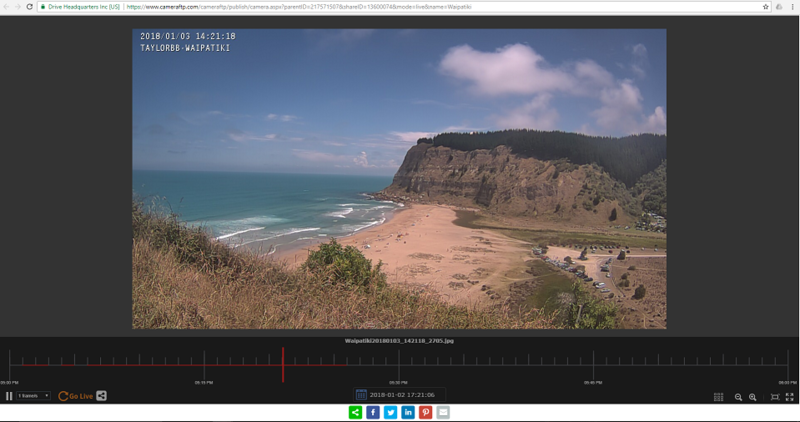 The regular publish feature can publish a camera, which includes the live video (image) and the recorded footage based on the retention days. Footage past the retention time is automatically deleted. If you want to keep some recorded clips permanently, you can download them to your local computer before they are deleted. You can also publish an interval of video clips. As of 12/31/2017, this feature is only available on Android CameraFTP Viewer app. 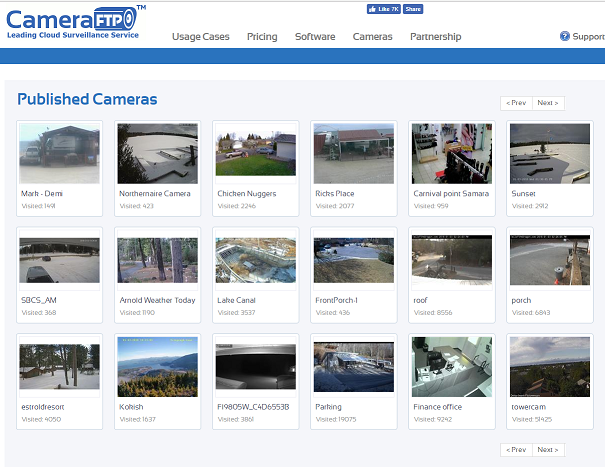 After you have published a video clip, you can view it from CameraFTP.com website. When you publish an interval of video clips, the system will automatically create a linked DriveHQ account. DriveHQ is a leading Cloud Storage / Cloud IT service provider. Your published video clips will be automatically saved to your linked DriveHQ account. These files will not be deleted automatically as long as your DriveHQ account remains active, or if you order a DriveHQ subscription. You can log on to your linked DriveHQ account from My Account Details page. Just click the Linked DriveHQ Username. The GetLastCameraImage API has been extended to support more parameters. You can get more image URLs based on the image index or time. time: UTC time (YYYY-MM-DD hh:mm:ss). Links to the camera image at the specified time. If there is no image at the time, returns the next image. minutes: Integer. Links to the camera image of the specified minutes ago. If there is no image at the time, returns the next image. For best performance, CameraFTP may cache images for up to 1 minute. So it is normal if the image does not refresh in 1 minute. If you must refresh the image at a higher frequency, it is recommended using our regular Publish URL. If you don’t want to make your camera public but still want to access a similar URL to get the latest camera image, then you need to use our Logon API. For more detailed information, please email CameraFTP customer support.